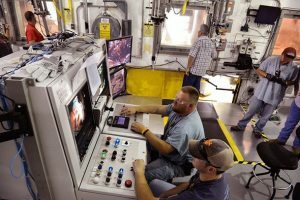 Photo Caption: North Wind Solutions operates the Transuranic Waste Processing Center in Oak Ridge. Employees at the facility process, package, and ship contact-handled and remote-handled transuranic waste for disposal at EM’s Waste Isolation Pilot Plant near Carlsbad, New Mexico. Kudos to North Wind Solutions and the TWPC project team! OAK RIDGE, Tenn. – North Wind Solutions, which operates EM Oak Ridge’s Transuranic Waste Processing Center (TWPC), earned nearly $383,000, or 97 percent of the available fee for the performance evaluation period of Oct. 27, 2017 through Oct. 26, 2018, according to a recently released fee determination letter. DOE’s Oak Ridge Office of Environmental Management (OREM) gave North Wind a “high confidence” rating for its cost and schedule performance and “excellent” rating for its technical performance for waste processing operation, according to the letter to the contractor. OREM noted that North Wind has continued to execute the scope under the TWPC contract very well. •Processed 28.89 cubic meters of contact-handled transuranic waste, surpassing its goal of 27.31 cubic meters by 5.8 percent. •Completed 44 transuranic waste shipments to the Waste Isolation Pilot Plant (WIPP) and underwent a recertification audit by EM’s Carlsbad Field Office without any major issues, demonstrating TWPC compliance with WIPP waste acceptance criteria. •Implemented an effective, well-managed safety and health program, with North Wind safely receiving, treating, and packaging transuranic waste from Oak Ridge National Laboratory. North Wind and its subcontractors processed 57.16 cubic meters of remote-handed transuranic waste, missing the goal by 2.8 percent. Still, North Wind successfully met a regulatory milestone for processing 97 cubic meters of remote-handled transuranic waste ahead of schedule.